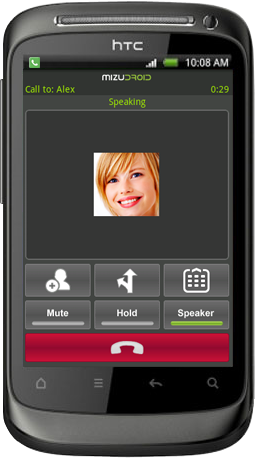 MizuDroid is an unlocked VoIP softphone for Android mobile phones and tablets based on open standards, compatible with all VoIP providers, software and devices using the SIP protocol. Initiate and receive free or low cost international calls via your preferred VoIP providers, PBX or your own SIP server. Mizudroid will deliver the best possible call quality for your environment by automatically adapting to your device/network/server and peers capabilities, ranging from HD audio to low bandwidth codecs and fine tuned media parameters. For VoIP service providers we offer customized builds and integration with existing infrastructure. The SIP softphone for Android has a small footprint but comes with a full feature set suitable for business usage with a long list of branding and customization options. MizuDroid works seamlessly with other Mizutech server and client side solutions, as well as with enterprise and carrier infrastructure equipment like Asterisk (and it's derivatives such as FreePBX, PIAF, Elastix), Audiocodes, Cisco, CounterPath, Voipswitch, PortaBilling and others. Similar to CSipSimple, Zoiper, 3CX and SIPDroid but focuses to fulfill VoIP service provider requirements such as extra business features, integration, customization and of course high call quality. MizuDroid is free for non-commercial use. Search for "MizuDroid" in the Google Play (Android Market) from your phone or visit the link below. What is an Android softphone? An android softphone is a software program for android devices allowing users to connect to a VoIP server and make calls to other VoIP users or to landline and mobile networks usually for lower prices than the native GSM calls. The free softphone can be downloaded from Google Play Store for personal usage. The Pro version ads more features such as G.729 and auto tunneling/encryption and it can be used also for commercial purposes or by companies. Download from Google Play Store and upgrade to pro version by paying $49 via PayPal. On your payment you will receive a license key by email within one work-day. We provide fully customized and branded softphone for companies. The customization options can be found here or you might check our All-In-One Softphone offer. We also provide Android SIP library for developers.